Falls Creek has quickly become a must ride location on any mountain bikers radar. With an amazing single track network as well as a wealth of back country trails, Falls Creek appeals to all styles of riders. You can either earn your turns or jump on the Blue Dirt shuttle service to make the most of the fast flowing descending trails. Riding the Blue Dirt shuttle to the summit of Falls Creek presents you with some of the best and longest descending trails in Australia. Choose your own adventure and link up trails such as High Voltage > Wishing Well > Flowtown and find yourself on a near 10km machine made descent stacked full of berms, jumps, rock gardens and more. Once at the bottom of Flowtown simply pop out onto the road and jump on our shuttle departing from the Resort entry gates and get ready for round 2! New Green Trail for for 2019: Greenline is a 5km green trail descent from the summit to the village – suitable for riders of all abilities, it sweeps out to the lake and back down into the village. 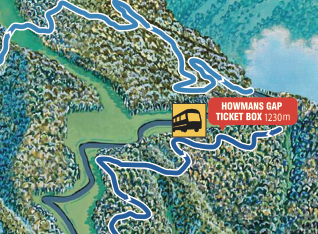 Our shuttle service picks riders up from both Howmans Gap (end of Flowtown) and also at the Village Bike Cafe located in Slalom Car Park in the resort village. Morning shuttle registrations are located at the Village Bike Cafe along with specialty coffee from Sensory Lab and delicious fresh locally food. The 2016 season will see the opening of the new Flowtown trail linking the current trail network all the way down to Howmans gap. When paired with other trails off the summit, riders will be able to sink their teeth into 10kms of descending trails with shuttles back to the top! Shuttles operate non-stop from 9.00am to 4.00pm. Ride the shuttle as often as you like! Enjoy a ~10km descent from the summit to Howmans Gap, session the new Flowtown trail, or ride within the resort area. The choice is yours this Summer at Falls. The gravity trails serviced by the shuttle at Falls Creek are best suited to All Mountain (Trail/Enduro) bikes. The trail network at Falls Creek also includes loops ideal for self-serve XC rides. You support a small mountain bike tourism business that helps you ride the best trails!